Today was a crazy day- I had to do a lot of picking up around the house, and in the course of doing laundry I noticed that my car’s brake lights were stuck on. I had to get my car jumpstarted and leave it running until it was time to pick T up from school. I did manage to get out to the garden for 15 or 20 minutes this morning! Guess what?! We have little broccoli heads on several Waltham Broccoli plants. Waltham is the city I lived in until I was 22 years old! I transplanted these seedlings the day before my father, who was a Waltham native, died. 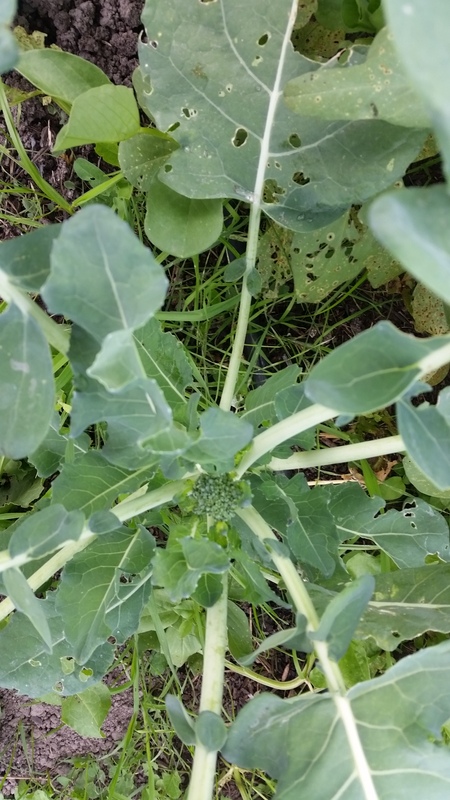 Here is a small amount of info about Waltham broccoli, which apparently was developed at the UMass Field Station in Waltham in 1950: http://ccgrow.com/phytotheca/broccoli-waltham-29/ It’s clearly not the correct variety for our hot northern California September and early October. I have several friends who work at or go to the Waltham Fields Community Farm on a regular basis 🙂 Here is a pdf with a little bit of info about the City of Waltham and the UMass Waltham Field Station and possibilities for “development” on the property.